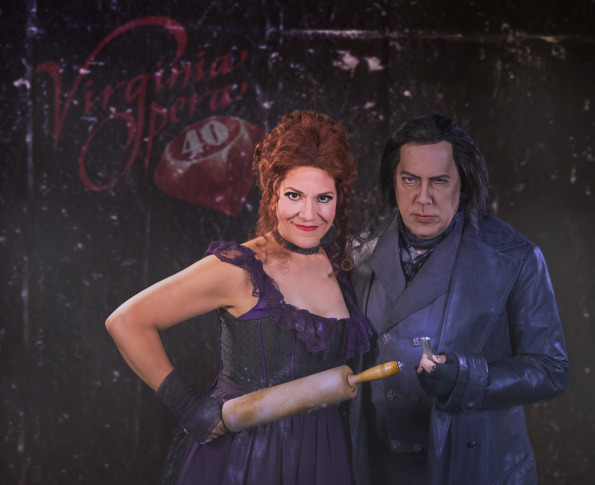 The deliciously disturbing tale kicks off Virginia Opera's landmark 40th-anniversary season. WASHINGTON — “Sweeney Todd, The Demon Barber of Fleet Street” is back. The deliciously disturbing tale kicks off a three-venue run by Virginia Opera, which is celebrating its 40th anniversary this season. The upcoming production promises to be more traditional than the summer’s “Sweeney Todd – Prog Metal Version,” which substituted Victorian-era music with a new sound that combined progressive rock’s experimental tendencies with heavy metal’s aggressiveness. As you might remember from Broadway shows, or perhaps Tim Burton’s screen version starring Johnny Depp and Helena Bonham Carter, “Sweeney Todd” is about a barber whose idyllic life is shattered by a corrupt judge. Tormented by the loss of his beloved wife, the sadistic Todd befriends an equally sadistic baker named Mrs. Lovett. The two engage in the kind of sick revenge reserved for the likes of Hannibal Lecter. In that tale, Todd makes his debut as a barber who murders his customers by throwing them down a trapdoor attached to a barber’s chair. Those who survive the fall are immediately killed. Their remains are then turned into meat pies and sold to unsuspecting Londoners. The story became a staple in Victorian England, and was later turned into a ballet in 1959. The story of Sweeney Todd isn’t new for director Ron Daniels. He first took a stab at the production in the late 1960s, before Sondheim had even written his musical. Daniels was an up-and-coming figure on the English theater scene at the time. He wanted to write a Victorian-themed play, and had cast members from his small theater company to help write a script. “Together we worked on giving the characters greater background, greater motivation,” he says. Fortuitously, the production was seen by Sondheim and became the inspiration for the famous musical. “More than 40 years later, here I am directing it again,” Daniels says. “Sweeney Todd, The Demon Barber of Fleet Street” opens this weekend at Harrison Opera House in Norfolk, Virginia. Check below for all dates, and click here to buy tickets.